Florida has a new goalie! Many expected the Jacob Markstrom era to begin in Florida this season, but that will be put on hold for one year, as long-time Boston Bruin, and guy who took last year off, Tim Thomas, has signed a 1-year, $2.5 million deal, with a $3.75 million cap hit with the franchise. After making the playoffs in the 2011-12 season, being knocked out by the New Jersey Devils in the first round in seven games, the Panthers ended up with the worst record in the National Hockey League last season, on the back of Markstrom, Scott Clemmensen and Jose Theodore. 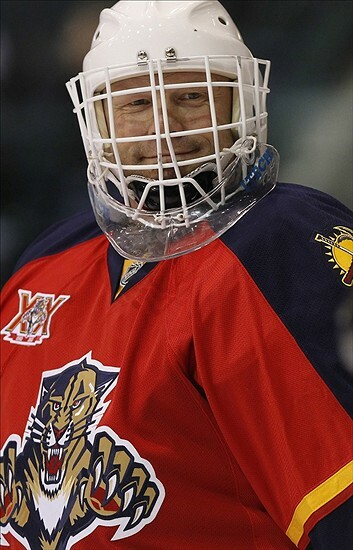 What does Tim Thomas bring to Florida? He joins Kris Versteeg (one) Brian Campbell (one) and Tomas Kopecky (two), as holders of Stanley Cup rings. However, Thomas is the only one with a Conn Smythe as playoff MVP. A two-time Vezina winner, one-time William M. Jennings trophy, and the first player since Bernie Parent to win the Stanley Cup, Vezina and Conn Smythe in the same season. The resume is plentiful, but Thomas is 39 years old. He didn’t play anywhere last season, so whether or not he’ll even make it out the year is a gamble for the Panthers, especially considering they seem to be outside playoff contenders at best. Perhaps he’s bought in to provide tutelage for Markstrom, but the latter will more than likely end up in the AHL when Clemmensen returns from injury. For those wondering, Florida play Thomas’ former team, the Boston Bruins (I don’t count the Islanders, even though he was on their roster, he never played a game for them, not even as backup) five times next season. Mark these dates on your hockey calendar! The media will be all over it, especially for the first game I feel. Even Bruins starter, and Thomas’ backup in Boston, Tuukka Rask, joked that it’s going to be a “media debacle”. Fun times to be had in Florida for the year ahead. Alexei Yashin was a stud for the Ottawa Senators on the ice. Off the ice, he would complain about contracts until the cows came home. He refused to play in the 95-96 season until he was made the highest paid player on the team. In 1998, he was to donate a million dollars to the National Arts Centre (NAC) in Ottawa, however the NAC learned that a condition of the donation would be to pay Yashin’s parents $425,000, they balked at the idea, and Yashin cancelled the donation. There would be more contract disputes to come, with Yashin refusing to honor the last year of his contract before the 1999-00 season due to demanding a raise and the Senators declining, he then demanded a trade. Ottawa responded by suspending him for the 99-00 season instead. Yashin, who was meant to be a free agent after the season, was refused free agent status by an NHL Arbitrator, and instead had to play out the final year of his contract in the 2000-01 season. Which lead the Ottawa Senators to trade Yashin at the 2001 NHL Entry Draft, to the New York Islanders. Which brought about one of hockey’s great debates. Which was worse? The contract the Islanders gave Yashin, or the players they traded in order to get Yashin. New York traded forward Bill Muckalt, defenseman Zdeno Chara, and the second overall pick in the 2001 NHL Entry Draft, which just happened to be Jason Spezza. The Islanders hoped that Yashin would provide the spark they needed, after picking up 94 and 88 points respectively, in the last two years he played. Muckalt only spent one season in Ottawa, and didnt really come to much. Chara has become one of the most feared defensemen, not just for the Boston Bruins, but in the National Hockey League, and Spezza has become the forward centerpiece in Ottawa and looks to be a future captain. But what about Yashin? He is the focal point of this blog after all. Well, the Islanders had so much faith in the Russian, that they signed him to a 10 year, 87.5 million dollar contract. Most found that an untradeable contract, but it was clear that in their eyes, Yashin was an Islander for the rest of his career. In his first year, Yashin helped the Islanders make the playoffs, but they never got past the first round during his tenure there, and after the first year, his production declined. Even after they retooled the roster around Yashin for the 2005-06 season, it didnt help, as the Islanders bought out his contract at the end of the 2006-07 season, leaving them with a cap hit of just over $2.2mil until 2015. Yashin is currently the eighth highest cap hit for forwards on the Islanders roster, even though he reitred from hockey in 2012. Yashin is a prime example of gambling gone horribly, horribly wrong. If the Islanders hadn’t of made the deal, then chances are they would still have Zdeno Chara and Jason Spezza in their lineup, and who knows where they’d be now. Maybe where they expected to be with Yashin.